The all-powerful ruling authority, the Common, implants sensors into its citizens, sensors into the eyes and into the ears. They can see what you see and hear what you hear, and everything is monitored and recorded. One wrong word, or action, and you can lose your citizenship, which means death. This is the world that Alpha has survived in for thirteen years, and he’s good at it. At the School, he’s an instructor rank, the highest ranking, which means almost no mistakes, for years. But now everything is unraveling. The Common has set their sights on him, systematically testing him to determine his allegiances. And what’s worse, they’re bringing Theta into this, the only person in the world that he cares about, and they might even kill her to get to him. And the only way that this gets resolved, and the only way he can keep Theta safe, is if Alpha finds a way to escape the School. But how can you run from an enemy who can watch you at all times, an enemy who knows everything about you? When a single misspoken word can destroy you? This book was good. Not great, but good. It starts off strong; the first chapter had me hooked and that’s always a good thing! It was intense and had me wondering what happens next. If you like dystopian/sci-fi genres, then I would definitely recommend this book for you, although I wouldn’t recommend to anyone who dislikes younger reads. The only reason I say that is because I find Alpha to be a little too whiny, even for my taste. Not saying that every leading male character has to be brooding and strong willed and oh-so-dreamy, but Alpha was a little much to take sometimes. Like a fly that keeps flying around your face that you can’t get rid of. Eventually the fly lands and you don’t seem to mind it’s presence anymore. You accidentally bump it’s new found resting place and all of a sudden he’s back to flying around your face for the next 10 minutes or so. That is Alpha in a nutshell! One thing I don’t understand about him though is how can he go from this whiny person one minute to willingly getting his neck cut open the next and then back to being whiny? (This particular scene though was wonderfully intense – just kind of makes me think Alpha pretends to be stronger than he really is or just likes the attention when he whines). “judge a book by it’s cover” type of gal. Why would I want to read your book if you clearly don’t put any effort to initially draw me in? Make me pick up the book with just the picture – make me want to read the book jacket! But this is a completely different conversation for another day. Getting back on track, this cover is great! It’s what made me read the book description in the first place. It really captured my eye and I love the idea of holding a picture of a ‘before world destruction’ over the ‘after math’. Kudos for the outer display! I really feel that this book should’ve been a “book 2” because I don’t feel like there was much background info before things started falling apart and they – Alpha & Chi – were on the run. THAT or they should add a few more chapters to the beginning. I’d really like to know more about where they came from, where they were growing up and I’d definitely like to know more about Alpha and Theta’s relationship. I want to believe Alpha on this whole ‘saving Theta’ quest but all I can think of is puppy love because I don’t know much about them. Which leads me into their age. I don’t know their age. How can I draw a picture in my head if I don’t know how old I should be picturing these people? Being whiny makes me think Alpha and Theta are younger but they can’t be THAT young to be going through what they’re going through, they were too mature in certain areas. On the back of the book, it says “This is the world that Alpha has survived in for 13 years,” so at least I know he’s 13+ .. but I can’t imagine he’s only 13. If this was explained, I completely missed it, so don’t quote me that it wasn’t – I’m not entirely certain. HALP! I did enjoy the scene where Alpha and Theta are thrown up against each other to fight – I got so excited reading about it but then it seemed to fall flat. I was really engulfed in this build up but felt like it went no where. Again, this is a scene where I feel like Alpha’s whiny and unruliness comes in to play. He just needs to stop. One last thing I’d like to point out because it was hard to stay enveloped in the book when this happened (and it happened frequently) but at the same time, I was informed that this in an ARC so it may or may not be something that will change. So instead of saying “this is awful blah blah blah” I would like to consider this a suggestion: There are a lot of areas where the writing seems to repeat itself. I don’t need to be reminded you’re in a forest 10 times in the same 2 sentences. I got you were in the forest the first time (exaggerated example but sometimes I felt this to be true). It would be great to change this in the final print/version because it really took me out of the story. All in all, I would recommend this book – and being at the end it quotes “End of Book One” I would definitely be interested in getting my hands on book 2 and seeing where this story goes! 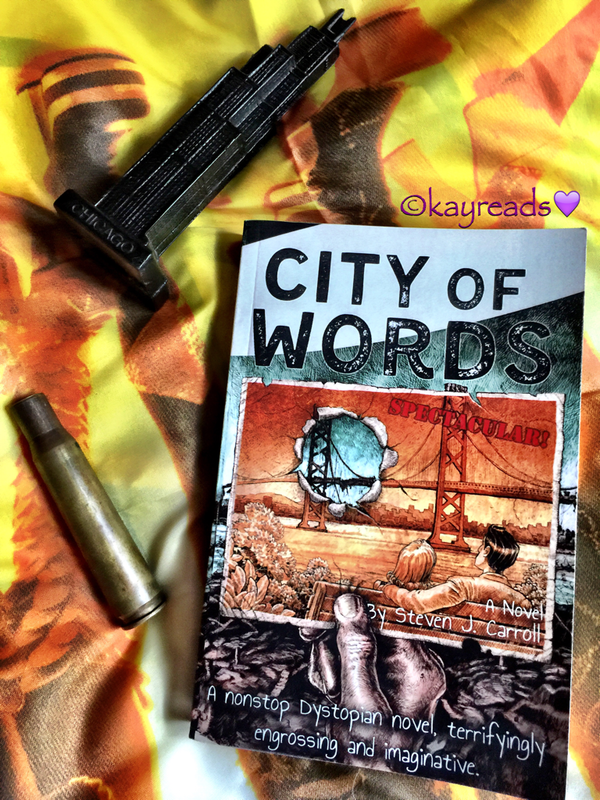 This entry was posted in Book Reviews and tagged arc, arc review, book, book blog, book geek, book love, book nerd, book review, Book Reviews, bookish, books, city of words, dystopian, literature, review, steven j carroll.